The palaeogeographical maps are available for viewing from the individual pages listed here. They are accompanied by short explanations. For more detail, readers should consult the further reading list below. Maps like these are only as good as the evidence available to construct them. We welcome anyone who has evidence that can be used to update the courses to contact us without hesitation! The maps can be downloaded directly by copy-and-pasting the image or in high-resolution pdf format from each individual page. The foundations of the modern drainage system of northwestern Europe were laid in the Miocene when earth movements associated with Alpine orogenesis and the opening of the North Atlantic were at their height. In general, these early rivers occupied shallow valleys and transported only chemically-resistant minerals and lithologies. The Pleistocene was marked by the appearance of cold climates. These climates resulted in fluvial dissection of the landscape, which stripped first regolith, then fresh material derived by periglacial processes. This material accumulated in the river valleys as gravel and sand deposits, which make up the overwhelming bulk of Pleistocene fluvial sediments. The rivers generally adopted braided courses during cold stages. The deeply incised modern valley system has developed largely as a result of rapid climatic changes over the past 2.4 Ma or so. Throughout this period the river system has undergone repeated adjustments in response to continental glaciation. These responses are discussed. 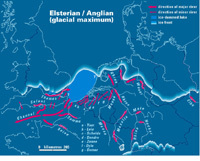 Particular attention is paid to the impact of the Anglian-Elsterian glaciation that blocked the southern North Sea to produce a vast ice-dammed lake, the overspill from which initiated the Dover Straits. 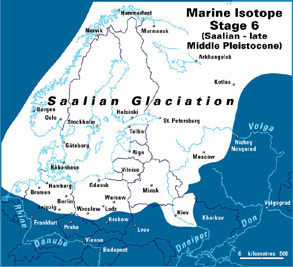 By contrast, interglacial sedimentation comprises predominantly fine, often fossiliferous sediments with rivers normally adopting single-thread channels, while estuarine sediments were deposited in areas invaded by high eustatic sea levels. The impact of sea-level change on the length of rivers and their courses is considered. The maps presented on the following pages are based on a review of the histories of the major rivers of northwestern Europe. They include the rivers Elbe, Saale, Weser, Rhine, Meuse, Scheldt, Thames, Somme and Seine. Two further rivers that no longer exist, the Baltic and Channel rivers, are also included. 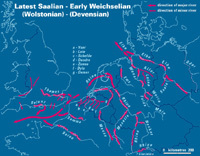 The histories of these rivers illustrate how the interplay of tectonics and climate have influenced the northwest European drainage system through the late Cainozoic. This work was originally published by Phil Gibbard in 1988 but the maps were updated in spring 2001 for presentation at the final meeting of the Netherlands’ NEESDI project held in Amsterdam. They are presented here, in downloadable format, for use by anyone interested in the longterm development of river systems. The drainage maps represent a contribution to International Geological Correlation Programme, IGCP 449: Global correlation of Late Cenozoic fluvial sequences . The glaciation maps (maps 3, 7 and 9) are drawn from the files of the INQUA Commission on Glaciation Workgroup 5 . They are reproduced here for comparison with the drainage maps. Northwest Europe is a unified geographical region which has undergone a broadly consistent geological and climatic history over the past few million years. Today the region lies in the temperate climatic and vegetational zone but during the recent past it has been subjected to climatic change that has given rise to long periods of periglacial and even glacial conditions. In coastal areas, sea-level change, largely driven by glacial eustasy, has caused intermittent regressions and transgressions; in and adjacent to glaciated regions, isostatic and forebulge effects have also caused major land- and sea-level variations. All these variations are superimposed on longer-term trends in climate and tectonic evolution of the continent. The drainage system of northwest Europe has evolved in response to the development of the continent during the late Cainozoic. 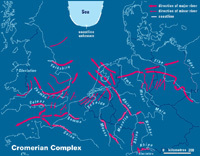 The position of the region at the margin of the Eurasian continent has been crucial in determining the events that have influenced its geological evolution. By their nature, rivers owe their existence to, and are strongly influenced by, tectonic activity and climatic variability. The interplay of these two major factors is responsible for determining the form of the modern river system, which should be considered as the product of continual remodelling. Because river valleys are major zones of terrestrial deposition, an understanding of their detailed geological record will provide a calibration of the geological evolution of the North Atlantic region as a whole throughout the past three million years. In addition, the intercalation of marine or estuarine sediments in the river sequences allows correlation with the offshore and potentially with the deep-sea facies. As will be shown below, there is considerable evidence of palaeoclimatic significance in river-sediment sequences; from this evidence it is clear that the northwest European rivers have functioned as an integrated system. 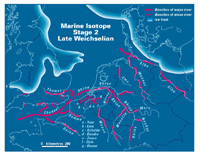 For the purpose of these maps, the great northwest European rivers include the drainage systems of the Elbe, Weser, Rhine, Meuse, Scheldt, Thames, Somme and Seine. In addition, two further rivers which are no longer in existence, the Baltic River and the Channel River, will also included. These rivers have been selected because their individual histories illustrate the impact and interplay of the major influencing factors. They also provide an important transect across the continent from north to south, i.e. 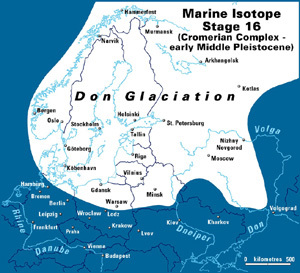 from the zone of maximum impact of glaciation, particularly during the Middle and Upper Pleistocene, to a zone which was apparently never glaciated. In order to appreciate the evolution of the northwest European drainage system it is vital to adopt a uniform stratigraphical timetable. 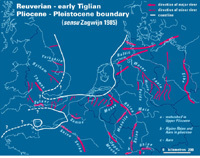 The Netherlands' Neogene stratigraphical terminology has been adopted, in which the Plio-Pleistocene boundary is placed at the base of the Praetiglian Stage (ca. 2.4 Ma BP). This widely applicable boundary is thought to be 'natural' in northwest Europe because it marks the first arrival of true cold climates. It has also been used extensively throughout the region in stratigraphical schemes. The response of the northwest European drainage system to the external influences of the past three million years has been complex being dependent on the scale and duration of the events. However, certain patterns emerge and indicate the impact of climatically- and tectonically-controlled variables on the system as a whole. These patterns are discussed on the individual pages below. Eissmann, L. 1997 Das quartäre Eiszeitalter in Sachsen und Nordostthüringen. Alterburger Naturwissenschaftliche Forschungen . Heft 8 , 1-98. Gibbard, P.L. 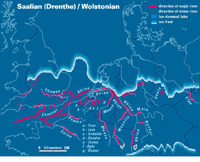 1988 The history of the great north-west European rivers during the past three million years. Philosophical Transactions of the Royal Society ofLondon B318, 559-602. Gibbard, P.L. 1995 Formation of the Strait of Dover. In: Preece, R.C. (ed.) Island Britain - a Quaternary perspective. Geological Society Special Publication. No.96, 15-26. Zagwijn, W.H. 1985 An outline of the Quaternary stratigraphy of the Netherlands. Geologie en Mijnbouw 64, 17-24. Ziegler, P.A. 1978 North-Western Europe: tectonics and basin development. In: Keynotes of the MEGS-II (Amsterdam 1978). (Ed. A.J. van Loon). Geologie en Mijnbouw 57, 589-626. The maps were drawn by Ian Agnew and Owen Tucker of the Cartography and Reprographics Unit of the Department of Geography, University of Cambridge. see also: History of the major rivers of southern Britain during the Tertiary pages.